The SGX GPS satellite signal simulator from CAST Navigation provides the user with dynamic, repeatable GPS RF signals for use in the laboratory or in the field for a wide range of GPS applications. The SGX simulator is housed in a portable, lightweight handheld enclosure measuring 7 × 11× 3 inches and weighing just over 4 pounds. The SGX replaces the CAST-SIMCOM simulator, a 17-inch, 50-pound simulator. The SGX is lightweight, portable, operates on AC or battery power, features 16 channels of L1 C/A- and P-codes, and is extremely accurate and repeatable. It is based on CAST technology that has been developed for use in the company’s larger military products. The SGX is controlled via an intuitive touchscreen interface that allows the user to select start and stop scenarios, change screen views, and change satellite RF power levels while a scenario is running. Three test scenarios are delivered with the simulator. XGen Scenario Generation Software. This optional software gives the user the ability to generate custom scenarios for use with the SGX. The software allows for complete control over GPS almanac, ephemeris, and all satellite error sources, including multipath. The user can select from a variety of vehicle types and simulate static or dynamic motion for land, sea, air, and space-based vehicles. The user may also employ antenna gain patterns and vehicle silhouettes. IFEN Inc., located in California, offers the IFEN NavX-NCS (Navigation Constellation Simulator), a premium-grade RF GNSS simulator. It is available in either the Essential or Professional version, tailored to the customer’s individual test and research needs. The NavX-NCS Essential simulates dynamic and static GNSS scenarios with up to 42 channels in the upper L-band (such as GPS / SBAS L1, GLONASS G1, Galileo E1, BeiDou B1, and QZSS / IMES L1) and is designed mainly for product testing and system integration. The NavX-NCS Professional offers up to 108 signal channels in virtually all frequencies and signals. Superior simulation options such as various feared events can be performed by the NavX-NCS Professional. Both versions of NavX-NCS offer high precision and numerous simulation options. Intuitive, user-friendly software makes test scenarios easy, fast, and clear, whether pre-defined or set up individually. These IFEN simulators have a unique modular hardware and software architecture, which offers great flexibility when it comes to changes in a company’s strategic test requirements. Every NavX-NCS is fully upgradeable, not only in the number of RF signal channels or available frequencies, but in a possible subsequent supplement of up to four RF outputs. Designed to be a versatile yet affordable satellite simulator, the GPSG-1000 is used by those validating and testing GNSS receivers in a variety of applications in the transportation, consumer electronics, aerospace, and military industry segments, to name a few. The GPSG-1000 is a single carrier, multi-channel GPS/Galileo simulator. Portable and ruggedized, it can be safely and confidently deployed in a variety of outdoor and indoor environments. The unit is available in a 6- or 12-channel configuration, and supports L1, L1C, L2C, L5, E1, E5, E5a, E5b, and SBAS (WAAS and EGNOS) signals. The GPSG-1000 can be directly connected to a GNSS receiver under test. It can also simulate actual “open sky” situations, whereby the unit can generate its signals through the included antenna coupler system that isolates and transmits to the UUT’s antenna(s). Utilizing an integrated GPS receiver, the GPSG-1000 simulates actual time of day and date as well as the real constellation that would be available for navigation at that specific time. Multiple almanacs and route files can be saved to memory, enabling current and past history dynamic motion, constellation environment creation/recreation, and other troubleshooting capabilities. During any given static or dynamic simulation, space vehicle parametrics and health can be user controlled. At less than 10 pounds, the GPSG-1000 features a touch-screen user interface that can be remotely hosted via an integrated Ethernet port. The unit uses a rechargeable, lithium-ion battery, enabling hours of untethered use, or can be used while the battery is recharging. LabSat and LabSat 2 are record and replay multi-constellation GNSS simulators. Designed as lightweight, easy-to-use standalone systems, the LabSat range has the ability to provide and deliver solutions for a wide range of testing requirements. Equipped with pre-recorded test scenarios and the ability to record and replay the user’s specific scenarios, LabSat delivers precise and accurate test results — replicating real-world situations in the lab or testing facility. 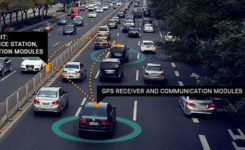 The range also has the ability to record and replay data from a wide range of data sources, including vehicle CANbus, inertial sensors — such as gyrometers and wheel speed sensors — and reference receivers. A recent innovation is the LabSat Turntable Solution, which allows for the replay of dead-reckoning turn-rate signals to be played into a navigation device to simulate use through built-up areas and urban canyons. Both LabSat and LabSat 2 can observe all satellites in view; while LabSat observes GPS, Gallileo, and SBAS, LabSat 2 includes GLONASS and BeiDou-2. Reliability of the gathered data can be assured when used together with SatGen v2, Racelogic’s simulation software. This scenario-generation software enables users to create scenario files based on user-defined trajectories, which can be replayed on LabSat. With SatGen v2, a scenario can be generated anywhere in the world, with position, route, speed, and time defined by the user. This high-performance software allows users to verify that their GNSS equipment performs as required in a variety of locations that maybe geographically remote or unavailable due to hostile environments. The GNSS simulator in the vector signal generator R&S SMBV100A is designed for development, verification, and production of GNSS chipsets, modules and receivers. The simulator supports all possible scenarios, from simple setups with individual, static satellites all the way to flexible scenarios generated in real time with up to 24 dynamic GPS, GLONASS, and Galileo satellites. GNSS simulator with support of GPS L1/L2 (C/A- and P-code), GLONASS L1/L2, and Galileo E1, including hybrid constellations. Simulation of realistic constellations with up to 24 satellites in real time (no precalculated waveforms). Flexible scenario generation including moving scenarios (import of NMEA waypoints), multipath, dynamic power control, and atmospheric modeling without the need for additional software tools. Unlimited simulation time with automatic, on-the-fly exchange of satellites. User mode in the GNSS simulator for full flexibility to select the satellites and to define the navigation data (import of RINEX files). Full localization for static and moving receivers with up to eight satellites with GPS P-code plus commercial C/A-code for complete testing of military receivers. Support of predefined and user-defined A-GPS test scenarios, including generation of assistance data. Easy way for time synchronous setup with two instruments for L1 and L2 band simulation. Support of digital communications standards. Spectracom’s line of simulators provides fast, comprehensive navigational, position, and timing testing for devices with GPS receivers. Designed for manufacturers and development engineers, Spectracom’s simulators provide complete testing of multi-channel GPS signal performance with high throughput and ease of use without unnecessary complexity or expense. All GSG-5 and GSG-6 series models are portable and fully operational via front-panel, web-based remote control, or SCPI protocol, and they operate with StudioView for easy scenario creation and file management. Most models are software upgradeable so users can easily add features as requirements change. GSG-5 Series. The GSG-5 series is a GLONASS and GPS constellation simulator that provides the basic set of features for testing GNSS systems. With a base of four channels, upgradable to 8, 16, or more, it provides navigational fix and position testing for in-line product testing or basic engineering and development testing. Versatile multi-channel GLONASS + GPS signal generator with pre-configured test scenarios. Includes advanced features such as SBAS (WAAS, EGNOS, MSAS, or GAGAN), white noise generation, and multipath simulation. GSG-6 Series (pictured). The GSG-Series 6 family offers multiple frequency band operation, multiple GNSS constellation simulation, and expansion to many more channels. Incorporating all of the features of the popular Series 5 family, the Series 6 line expands the capability to simulate all the new, emerging GNSS signals. With a base of 32 channels, upgradable to 48, 64, or more, it provides navigational fix and position testing for engineering and development testing. GPS standard, new (L2C, L5) GLONASS, Galileo, and Beidou/Compass coming soon. Simultaneous multi-frequency P-code (unencrypted) and C/A code. Simultaneous GNSS Constellation P-code and C/A codes. Spirent provides simulators that cover all applications, including research and development, integration/verification, and production testing. GSS8000 (pictured). Spirent’s flagship simulator, the GSS8000, is fully approved for Y-code, SAASM, AES M-code, and SDS M-code testing. Spirent provides options and configurations for testing GNSS interference effects and interference mitigation techniques, such as integrated GPS/inertial testing, CRPA testing, and jamming/anti-jam simulation. Spirent has delivered simulators that produce both legacy signals as well as modernized signals such as 2C, L5, and L1C. In addition to GPS, systems can include GLONASS L1/L2, Galileo, and Beidou-2, plus SBAS (WAAS, MSAS, and EGNOS) and Japan’s QZSS. CRPA Test System. Spirent’s Controlled Reception Pattern Antenna (CRPA) Test System generates both GPS L1/L2 and interference signals; multiple GSS8000 chassis may be combined to coherently control up to seven antenna elements. Null-steering and space/time adaptive CRPA testing are both supported by this comprehensive approach. GSS7790. Spirent’s GSS7790 Multi-Output Simulation System allows the signal from each satellite to be mapped to a separate RF output. These signals can then be fed to individual transmit antennas, which, when suitably deployed in an anechoic chamber, replicate the spatial diversity of satellite and jammer signals incident on the receiver antenna. Additional flexibility is offered as the signal is further split into its GPS L1 and L2 components, as appropriate.